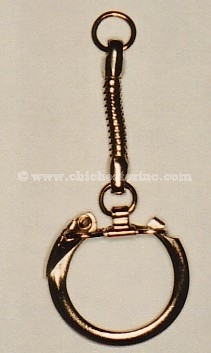 Click on above picture of our Nickel (left) and Gold (right) Snake Key Chains for larger view. The snake key chains are great for making raccoon or fox tail key chains when used with one of our fur clasps (no split ring required). Please note that the listed prices are per key chain. Click HERE for all of our Key Chains. Click HERE for Animal Tails.